I was wrong about the rand. I thought it was going to go up to R10 a dollar, but I'm not going to cry about it. 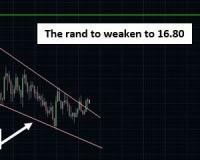 You can see looking at the USD/ZAR (United States Dollar versus the South African Dollar) weekly chart, a large wedge pattern formed from January 2016 up ‘till August 2017. A wedge pattern is known as a reversal pattern where the price wedges down into a triangle formation. And after some time near the bottom of the apex of the triangle, the price breaks up and out of the pattern. We’ve seen this as the price of the USD/ZAR has dropped from R16.80 down to R12.30 per dollar. And now the USD/ZAR has broken above the pattern and is currently sitting at R13.30. The rand tanked because Zuma survived a vote of no confidence. Consequently, confidence in South Africa has dropped. But this isn’t the only factor causing the rand to crash. We also have other catalysts that can cause the rand to weaken further. And when I look at the pattern on the chart, the next target is at the top of the wedge pattern. This means I expect the rand to weaken to R16.80. You can simply buy the USD/ZAR Spot FX or CFD and hold until it touches the target level. Or you can join my Red Hot Storm Trader service where I’ll send you companies that will shoot up in price thanks to the rand weakness. Companies in the resource sectors like Anglo American, BHP Billiton, Exxaro and even African Rainbow Minerals are all looking hot on my watch list right about now.